Would it surprise you to learn that you don’t have to be able to draw to add visuals to your journal? In fact, there are tons of ways to pull it off that don’t require an art degree. 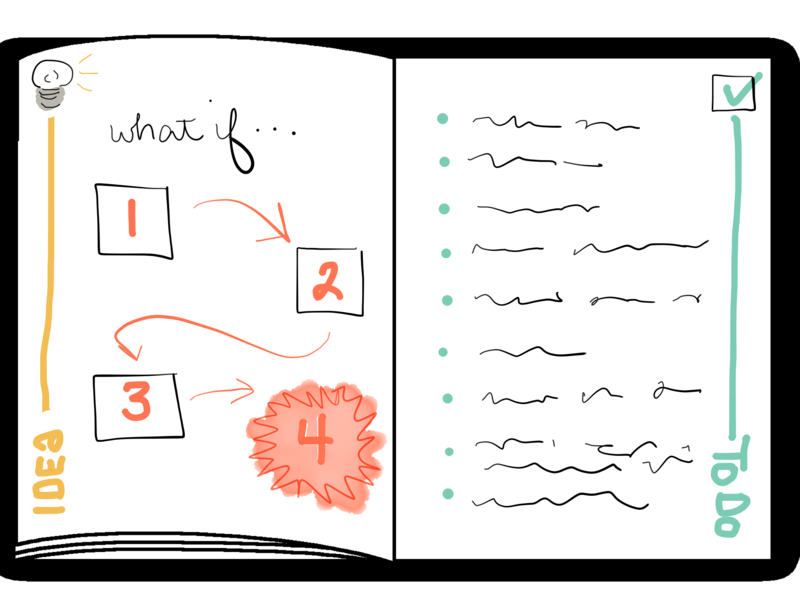 If you are going to include graphics in your visual journal, you will need to create some space for them. It is likely that you will add the graphic embellishments after you capture the information. Leave the facing page of the spread completely blank. Even if you don’t plan to fill it with a large graphic, a small graphic with a lot of white space around it can be really nice. Incorporate an empty “box” into your layout. Wrap your text. The easiest way to create wrap text while journaling is to lay a piece of cardboard (whatever is handy…business card, bar coaster, mason jar lid, etc) over a part of the page to block it when you are writing so that you have space later to come back and add a graphic. Consider that magazines get their visual content from somewhere else—usually a photographer or illustrator. Since journals are for an audience of one, you don’t have to be super picky about where you get your content. Print, clip or draw any image that inspires you and size it to fit the blank space. Printout from an online image search. Ephemera like ticket stubs, fortunes from cookies, tea bag tags, wine bottle labels, cut out from a cereal box or envelope, etc. There are a wide variety of adhesives to fix your materials into the space. Double stick tape is particularly effective and easy to find. Glue sticks don’t often last over the long haul, unless you purchase one specifically made for scrapbooking. Other adhesives that can be fun to play with are photo corners and sticky dots. Anyone can draw basic shapes—even if they do it poorly. Stick figures and other simple lines and shapes can be used to communicate ideas. Remember that your journal is for you. There is a website called TheNounProject.com that is a catalog of thousands of nouns represented as simple icons. Search for the idea you want to communicate and see what’s there. Then doodle it. Terribly. This is about creating a memory device—not something that will be auctioned at Sotheby’s. Adding visuals to your journal gives it dimension. It makes it more interesting and the concepts on the page more memorable. If you liked this article and want to save it, share on Pinterest with the graphic to the left.